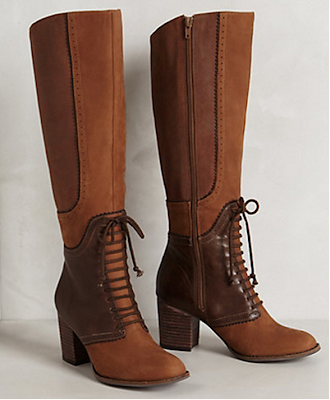 Today's So Shoe Me is the Tara Saddle Boots by Farylrobin, $248, available at Anthropologie. Take on new heights in this heeled everyday tall boot by Farylrobin. This versatile riding boot has mix of contrasting textures in tonal shades of brown for the perfect day-to-day boot for transitioning into fall. The leather lace-up accent adds a luxe detail while the chestnut brown suede and knee high height adds a retro 70s silhouette. Pair these practical boots with a button down blouse, tartan shorts and some scrunched patterned socks for a playful and preppy pre-fall outfit. So Shoe Me a pair of leather and suede knee high boots that mix tough textures and a retro shape for the perfect everyday fall boot.